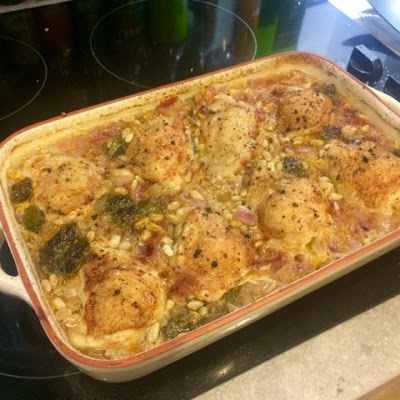 You can be the keenest cook in the world, but sometimes family life requires a recipe that allows you to just throw everything in a pot, shove it in the oven and pull out a delicious family meal an hour later. This is one of those recipes. It’s so tasty it almost feels like you’re cheating as you’ve put so little effort in. I like a good chicken traybake. Done well, the meat is nice and juicy and tender and the skin goes nice and crispy. 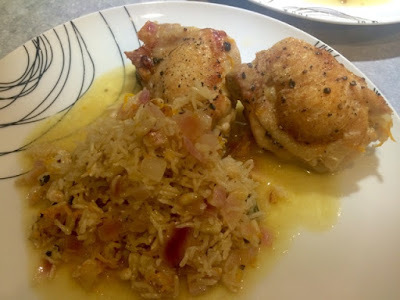 There is a very strong citrus theme with this dish but you can really mix the flavours up. 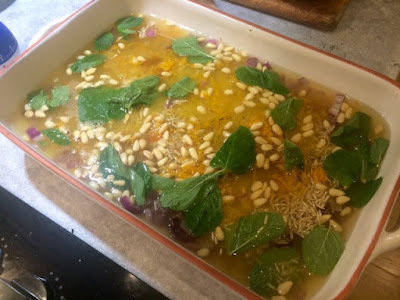 As long as you have enough liquid stock in this dish to cook the rice you could give it more of a Moroccan/Middle Eastern theme with spices, olives and dried fruit or go Mediterranean with loads of herbs and garlic. This was a totally experimental dish on my dinner table, I’d not dished up anything like this before and it went down so well. Plates were cleaned, seconds were had and The Boyfriend took some in a packed lunch for work the next day. This is definitely a crowd pleaser and good enough to serve up at a casual dinner party as well as family meals. 2. Sautée onion in a little oil until softened. 3. 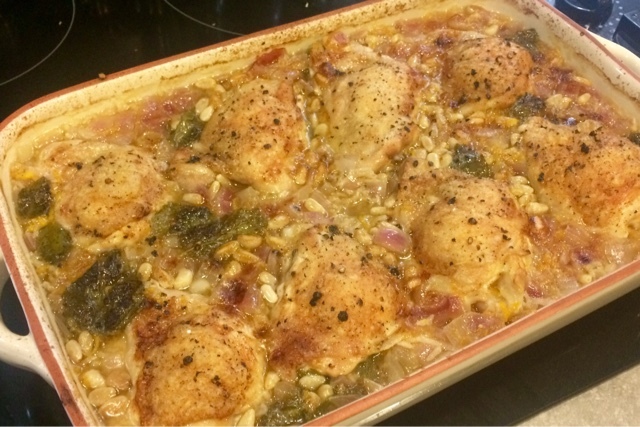 Tip the cooked onions into a large oven dish then use the same pan to lightly brown the skin on the chicken thighs. This will just encourage them to crisp up nicely in the oven as you’ve already got the job started. Do in batches rather than crowding the pan. 4. 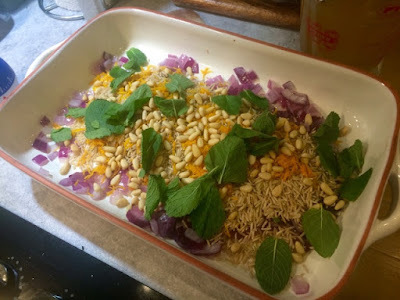 Add the rice, lemon zest, pine nuts and mint to the oven dish with the onions. 5. Pour in chicken stock and the orange juice. 6. Nestle the chicken thighs into mixture, skin side up to ensure it crisps up. 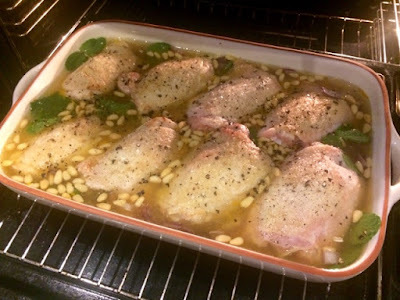 Bake in the oven for 55 minutes. 7. 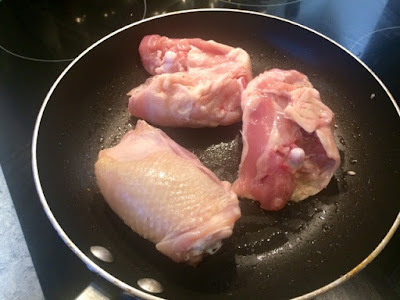 Remove from the oven and serve everyone a couple of thighs and a good scoop of rice with a little sauce. Serve some bread on the side to mop up all the lovely sauce. I made a focaccia loaf to serve with this Saturday night dinner. This looks absolutely delicious! I haven't tried making anything with orange and chicken but I'm tempted now!